Please refer to our stock # 3207 when inquiring. Radiant Miniature Roman Glass Pilgrim Flask, ca. 3rd Century CE. Found in the Holy Land. Intact and in excellent condition. 2 1/2" x 2 1/4" x 1". Ex: R. Swetits collection, New Jersey. This ampulla is shaped like a flattened gourd with small handle on side and radiant small spout. 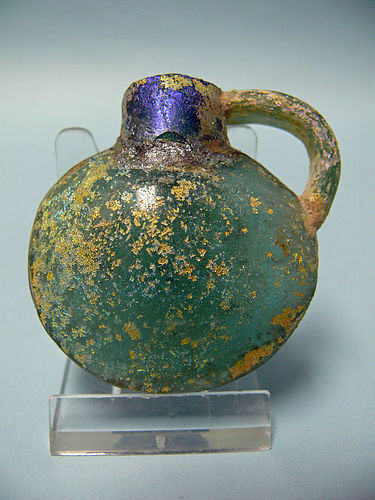 Pilgrim flasks, or ampullae, are small metal, glass, or terra vials such as this one, used by pilgrims in Antiquity and in the early Middle Ages, to carry home water or oil from the lamps burning in the sanctuaries visited. They also held oil that had been placed near the relics of a martyr and even earth scooped up piously from around a worshiped tomb. Religious pilgrimages were already well established in the pagan traditions of Antiquity. Worshipers returned home from these trips with souvenirs of terracotta figurines and amulets depicting the deity visited. Early Christians adopted this custom and undertook pilgrimages to the tombs of saints and martyrs. Stories of these voyages have survived, such as Etheria's Pilgrimage, a narrative of a trip she made to the Holy Sites in Egypt and the Middle East in the fourth century. Etheria received "holy flasks" from the monks who provided hospitality to the pilgrims.